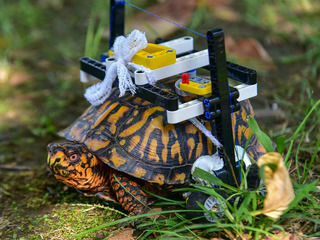 Thanks to some ingenuity, creativity, and a handful of LEGOs, a wild Eastern box turtle will soon be back on the move at the Maryland Zoo. The turtle was found in Druid Hill Park by a zoo employee. The reptile had multiple fractures to the bottom of his shell. Zoo veterinarians were struck with a challenge of healing the wound properly while allowing the turtle to still move. They performed stabilizing surgery, using metal bone plates, sewing clasps, and surgical wire to hold the shell's fragments together. But now the issue was keeping the bottom of the shell off the ground. "They don't make turtle-sized wheelchairs," said Garret Fraess, a fourth-year veterinary student performing a clinical rotation at the zoo. "So we drew some sketches of a customized wheelchair, and I sent them to a friend who is a LEGO enthusiast." Soon the grapefruit-sized turtle was sporting a new, multicolored wheelchair. A LEGO frame surrounds his shell, with plumbers putty attaching the edges to the shell's top, allowing him to stay off the ground but still use his legs to move. Relying more on his front legs, the turtle can now move around similarly to how he naturally would. He can even fully close his shell. Do to a slower metabolism, turtles heal slower than animals like mammals and birds. He will likely keep his new medical apparatus through the winter and into the spring, when hopefully his shell will have healed. Since 1996, the Maryland Zoo has run an Eastern box turtle monitoring project in Druid Hill Park, tagging, recording, and releasing 132 wild turtles in the process. The research helps staff get a better idea of how native Maryland species live in urban settings, and how turtle territories and behaviors may be changing for a species that is rapidly declining. The zoo houses a few of the species in it's Maryland Wilderness area.